Corner Office with a … Basement Light! From the middle of the room, standing. I must say — I love it. It is indeed a unique experience to be working with your head about 7 feet off the floor. It feels like and “office” but still a part of “home. Tonight my 2 older sons and I went to Lowes to pick up some parts for a sub project. We wanted to add some nice bright lighting underneath the platform, so they could host more activites down there. They like puzzles and reading, so you need a good bit of light for that. I really didn’t want glass shattered all over the place, so good sturdy cover was required. At the same time, sharp metal parts were out for safety reasons. We picked up satin nickel finish 48″ low profile fluorescent light fixture. It has smooth edges, a sturdy plastic cover, and lies very flat. But alas, it did not have a switch. So we picked up some good sturdy wire nuts, a heavy duty toggle switch, and a grounded extension cord (soon to be light cord). After we brought the light home and unpacked it, I started evaluating how I was going to mount it. It was setup so the wires would go directly out the back, presumably into a junction box in the wall. But we were mounting it to solid wood, so that was a no-go. So I did what any other red-blooded male would do in his workshop — dissembled the entire light. Here we found that each side of the light is hollow aluminum, about 1.5×2.0″, and all of “their” wiring was in the one side. First, we took the one aluminum piece and clamped it in my drill press. Then using a 3/8″ end mill, I milled a slot about 1/2″ by 1″ – just large enough to slip a wire nut through. 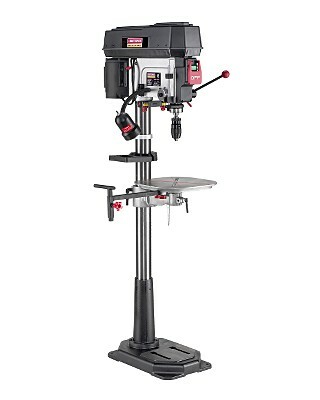 (I know the drill press is not especially suited for that, but my milling machine was just too small). Secondly, we drilled ~1/2″ holes in all four end caps. Why four? Because there were “functional” end caps, and “pretty” covers. That was a bit tricky, because the end caps were die-cast aluminum – not exactly the kind of material you want to clamp really hard. And it was elliptical, so there was no convenient place to clamp it. We ended up fabricating a custom hold-down setup using a 2×6, piece of scrap aluminum, and 2 wood screws. Thirdly, we connected all the wires. The extra wires were heavy gauge stranded wire normally used for house wiring. On the one end, I mounted the toggle switch, and on the other end, I ran the cut end of the extension cord into the light fixture. Each of the 8 connections were very carefully twisted and wire nutted, and then covered with 3M electrical tape, just for added security. 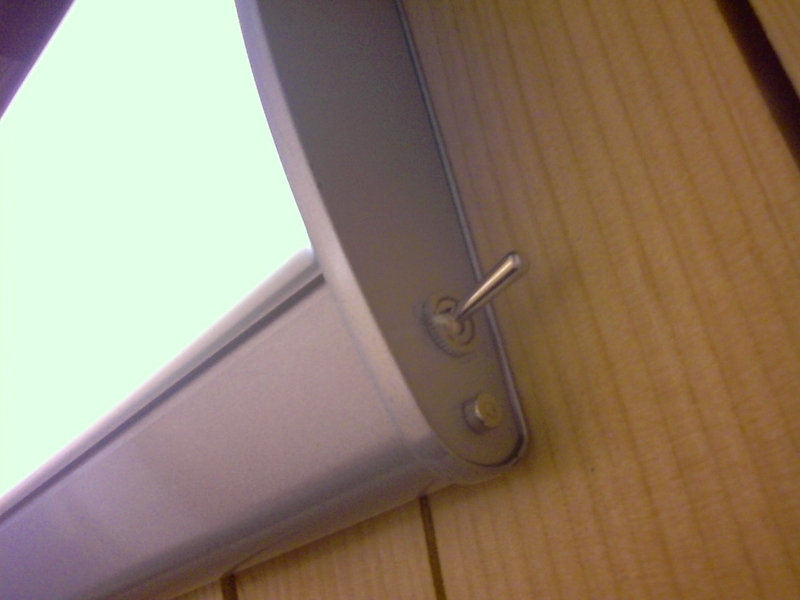 Lastly, we installed it. Using 3 normal wood screws, we attached it to the “ceiling” of the space under the platform – right up against the padded steel beam. It really fits in, and is amazingly bright. The really narrow florescent tubes perform quite well. The boys love it, and it is quite safe (as far as banging heads off of it, etc…). 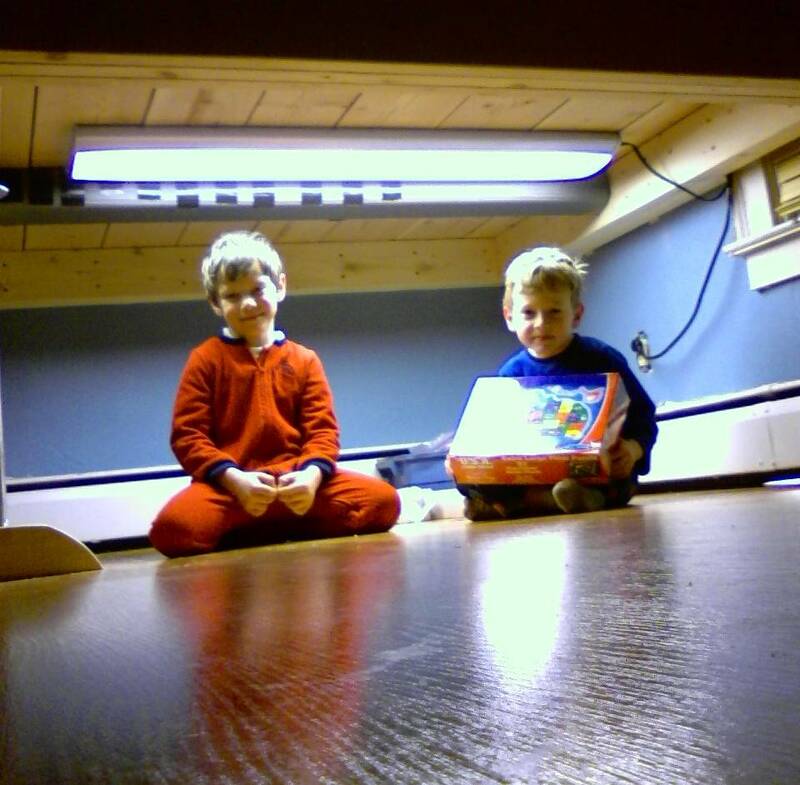 Two happy boys in their new play area, under my office. This entry was posted in Engineering, Fun, Life and tagged Desk, Kids, Office, Projects. Bookmark the permalink.